I illustrated new species of mites (Acari) at the Queensland Museum for a couple of years. 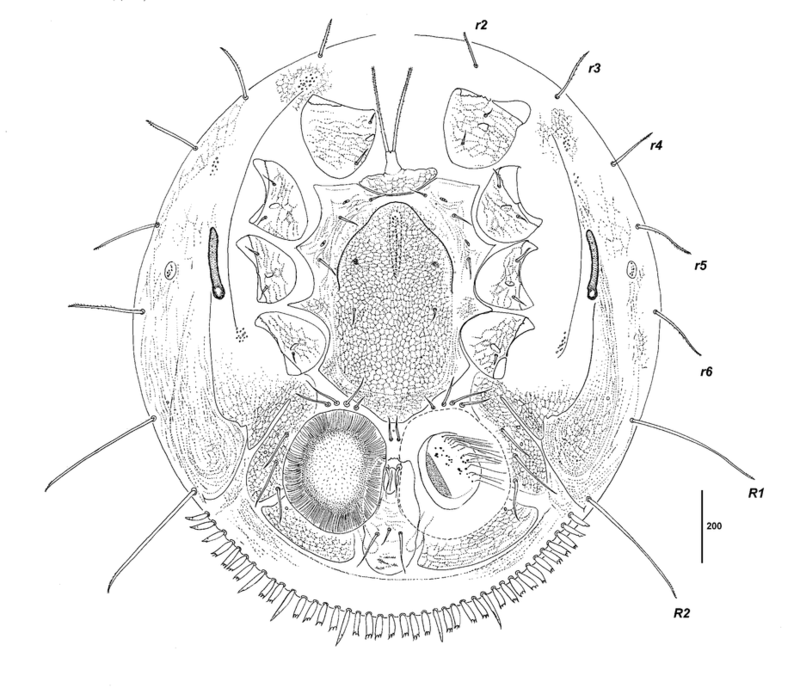 Working closely with taxonomists, my job was to draw the features of the mite. 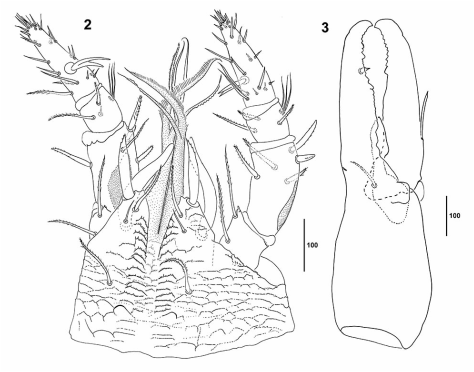 These drawings became part of the taxonomic description for new species, and are published in journal papers. This is the left 'shoulder' and three hairy legs of a mite, as seen at a high magnification. I love the rainbow effect of the special light filter! 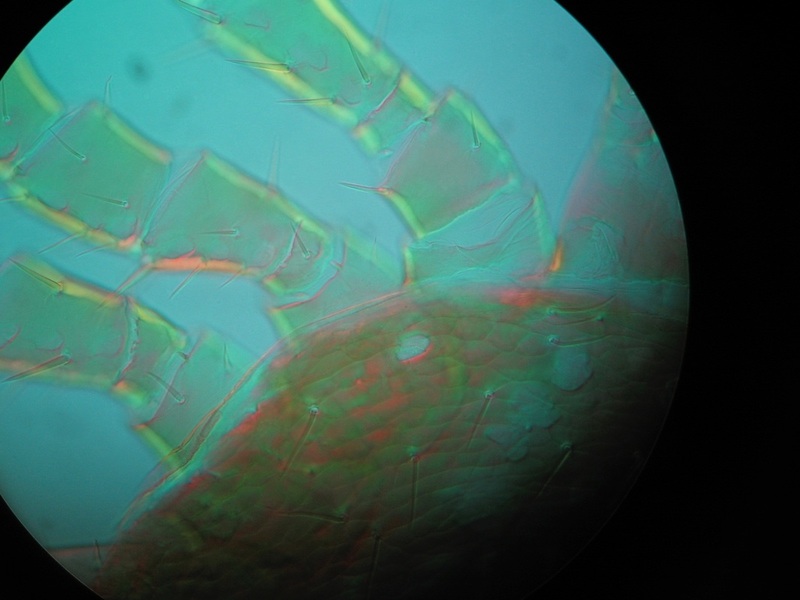 The mite has been chemically 'cleared', mounted onto a slide and pressed flat under a cover slip. I drew the mites by tracing their features using the camera lucida attachment on the microscope. Sometimes we'd show features above and below the surface, incorporating as much information as possible into a single picture. This photo shows me drawing the venter (underside) of Berzercon ferdinandi. 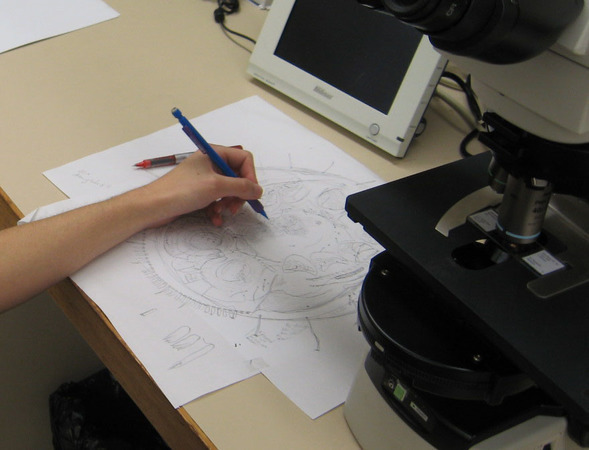 Drawing the venter of Bezercon ferdinandi, using the microscope with camera lucida attachment. Drawing mites is like drawing a map. The mite is pressed flat onto a slide, and every hair, pore and wrinkle is mapped out in the illustration. The taxonomist would review my drawing, checking for mistakes like a missing hair or pore. The final drawing is officially filed as the exact description of the species, so it's got to be perfect! Every single hair (seta) on the mite has a name and its presence/position are significant in identification. ​These are the 4 scaly legs from one side of Berzercon ferdinandi. The scale is 100 microns. This is the final illustration of the venter of Berzercon ferdinandi. It's been traced over again in ink, and then digitally labelled for publication. Berzercon ferdinandi is found on carabid beetles in New Zealand. ​Seeman, O.D. ; Baker, M.R. 2013: A new genus and species of Discozerconidae (Acari: Mesostigmata) from carabid beetles (Coleoptera: Carabidae) in New Zealand. 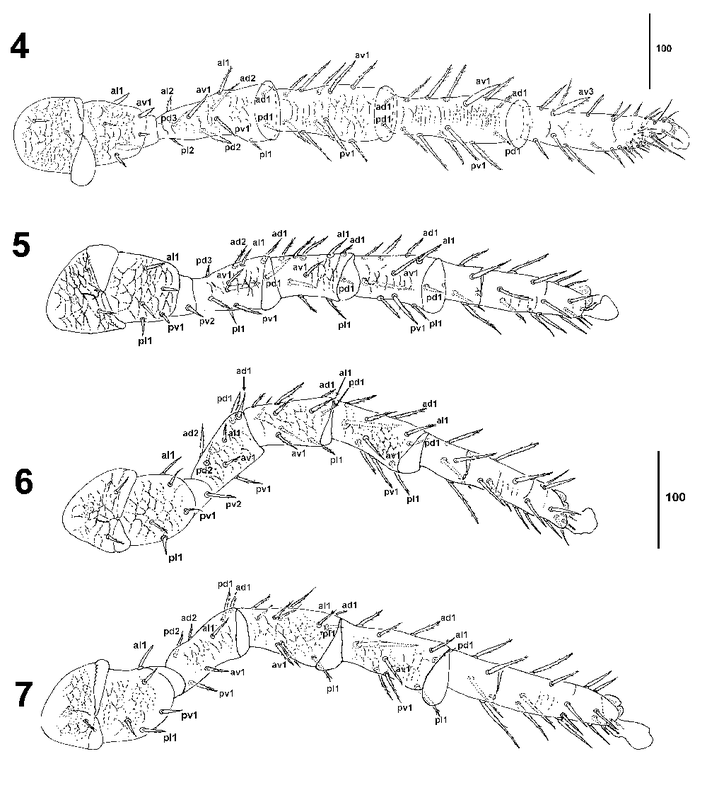 Zootaxa, 3750(2): 130-142. doi:10.11646/zootaxa.3750.2.2to edit. Images: All images are illustrated by Michelle Baker, credited to the Queensland Museum.